Betfair Pro Trader: What moves a market? Market prices fluctuate in horse race betting markets as the wisdom of the crowd attempts to settle on the true prices for the horses in the race. What moves these prices? Information. When a race is first placed on Betfair the night before there is little liquidity, people are waiting for the right price before they place a back or lay bet. There will be forecast prices with which to judge if a price is fair. Some of the old fashioned value bettors may even have created their own forecast or tissue of prices. Tentatively bets are placed as the market feels for the true prices. Some horses will become non-runners and removed from the betting. That creates new information as it will affect the dynamic of the race. Maybe a front runner was removed and the pace of the race will now be different, which might suit a horse other than the favourite. In the paddock the look of the horse will be transmitted via television or radio both online and off, prices might move from this added information. As the horses trot or canter up to the start yet more information is gleaned and yet again prices might move. If the race is to use stalls and a horse is acting up then that is more information that might move a price. With in-running betting permitted yet more information is fed to the public via the media as the race is run. We see prices move dramatically during the race as the winner moves towards 1.01 and the rest of the field to 1000. There is one final piece of information and that is the price itself. A great deal of volume is created by traders. A trader taking a position is creating volume and that information is entered into the market. But what if traders act upon false or non-existent information? Traders will have their own metrics for judging when to enter into a market. They might use a variation of weight of money or look at moving averages or any of a multitude of other technical trading signals. However, if a false signal makes a few of the faster traders enter a market then that will create false momentum. Slower traders will see this momentum believing it to be created by true market moving information and enter the market too. A self-fulfilling prophecy is created. Those traders who entered the position early can feed off the latecomers and take one or two ticks of profit from the late traders buying up the return legs of the early traders. The later traders get nothing and in many cases a loss as the value bettors move in and arbitrage the price back to where it was. The fastest traders then pat themselves on the back, another successful trade. The slower traders curse themselves. You could call such trading activity a Ponzi Scheme whereby the early adopters gain and the latecomers lose. Indeed, the Dark Pools in financial markets use a similar profit making scheme called front running, whereby High Frequency Trading bots ramp up the price so that latecomers have to pay more for the stock, thereafter the price reverts. Although being the fastest trader on Betfair is not illegal, it would be interesting to see how successful the best traders would be if the playing field was level for all traders. 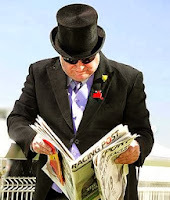 Arbitrageurs - Those looking for value by taking a position by either backing a horse to win or laying a horse to lose. Statistical arbitrageurs use fundamental data to determine what the odds should really be. Pure arbitrageurs are looking for mispriced selections across multiple markets. Speculators - A short-term trader who will place two bets, the outward leg and the return leg. They expect to make a profit from the difference in price between the two legs as the spread (where the back and lay prices meet) moves up or down. A betting market is a dynamic environment awash with information. There will be information of value and information that is not of value. Fundamental information - Relating to a horse and which can be verified from past races. Technical information - Market prices that can be verified only after the event. It is easier to verify fundamental information than technical information. There will be many false signals given by the market as prices move to their final starting price. For an arbitrageur this is not a problem as they can refuse a price. The fastest and most skilled traders can probably get away with scratching trades based on false information. The slower traders will find it hard going and will make a loss.